Lot produced Vin Noir or Black Wine by heating part of the grapes. by using a prune oven to gently heat the must—a winemaking process which has not been used for centuries. A selected parcel on the 3rd terrace, clayey-siliceous and clayey-calcareous soils on gentle slopes. ageing carried out in French oak casks for 12 months. 3rd Terrace; clayey-siliceous and clayey-calcareous soil with iron ore on gentle slopes. "Single Vineyard Selection AC Cahors The Trilogie consists of three 100% Malbec wines from three different terraces representing three different terroirs of Cahors. Carefully chosen plots are being worked separately to yield wines which would faithfully reflect the vine’s history with regards to the soil, the climate, its exposure and ecosystem." Terroir: 2nd Terrace. Red clay with limestone layer situated on a slight incline with great sun exposure. Terroir: 3rd Terrace.Clay and limestone with soil deposits of iron and lava residue; intense exposure to the sun. Terroir: 4th Terrace. Limestone with an abundant presence of iron. Estate Bottled AC Cahors The name Clos Triguedina “Me Trigo de Dina” means “Longing to dine” in the ancient Occitane. The name of the family estate is reflected in this classic cuvée, made by the winery since 1830 and for 7 generations. A wine of consistency and high quality, preserving both its typicity and finesse. 85% Malbec, 10% Merlot, 5% Tannât. 2nd, 3rd and 4th Terraces; clayey-siliceous and limestone-clay soil on gentles slopes planted more than 30 years ago. Certification: High Environmental Value. Environmentally friendly and traditional methods of working. Vatting time from 15 to 18 days; aged in french oak barrels for 12 months. Certification: High Environmental Value. Environmentally friendly and traditional working methods . No oak, pure fruit. Estate Bottled - IGP Comté Tolosan With this cuvée, Jean-Luc Baldès shows the potential of white grapes Chardonnay and Viognier with the beautiful limestone terroir of Cahors. The grapes are planted on the top of the valley and harvested early in the morning to preserve the freshness of the fruits. 4th Terrace; clayey-calcareous soils; situated at 300 meters of altitude. 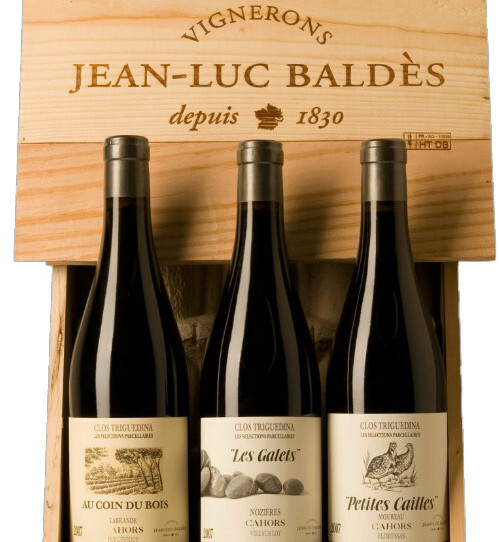 Jean-Luc Baldès reproduces the Moon Wine (Vin de Lune) of the 17th century, when the peasants picked the grapes at night in order to conceal part of the harvest from the local landowner, therefore, paying him less taxes. Today, the grapes are harvested early in the morning to keep the freshness of the fruit. 4th Terrace; clay and limestone soil situated at 300 meters of altitude with a full southern exposure to the sun. Estate Bottled - IGP Comté Tolosan One of the first rosé wines in the region of Cahors, Clos Triguedina Malbec Rosé is blended from the grapes harvested early in the morning in order to preserve the freshness of the fruits. Vibrant pink in color this refreshing rosé will help you beat the summer heat. Clayey-calcareous and siliceous soil of the 2nd and 3rd terraces. Certification: High Environmental Value. Environmentally friendly and traditional methods of working of the vines. Harvested early in the morning; a press and bled rosé. Discover Bul’s, a Sparkling Rosé by Jean-Luc Baldès, made by using a traditional Champagne method. The very first sparkling Malbec ever produced, this innovation is a testament to Jean-Luc Baldès’s passion for creativity and knowledge of the Malbec grape. A wind of daring change is blowing at Clos Triguedina causing Malbec grape to sparkle for the first time. ! 3rd Terrace; clayey-siliceous and calcareous soils. Certification: High Environmental Value. Environmentally friendly and traditional methods of working. Traditional fermentation method for sparkling wine; aged for 9 months in bottles. Innovation is not the least of qualities of the talented and audacious wine maker Jean-Luc Baldès, recognized as a specialist of Malbec. This Black Vintage is a proof: a nectar stemming from ripe Malbec grapes, aged with care and patience for 3 years in French oak. Today Black Vintage reveals its gained complexity for your to enjoy the delicious sips. 4th Terrace; clay and limestone soil situated at 300 meters of altitude with a full southern exposure to the sun . Certification: High Environmental Value. Environmentally friendly and traditional methods of working. Manual harvest; aged in french oak for 3 years.